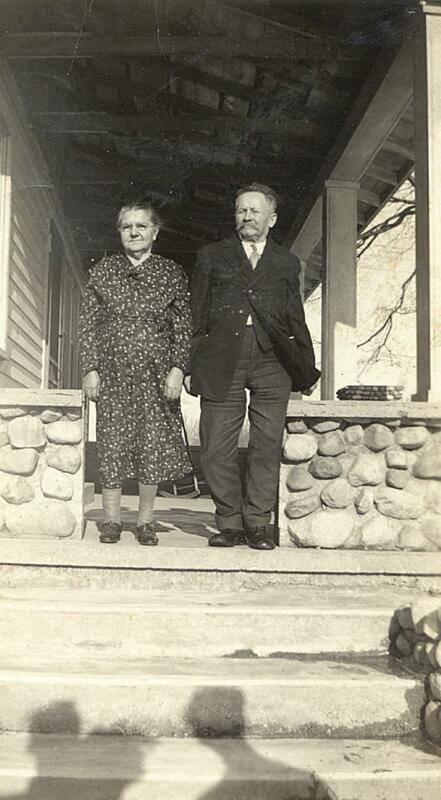 Comments: Midard Beck (Nee: Vogel) | Galesburg Michigan United States | 1921-1940 | Comments: Great grandfather Midard Beck and Great Grandmother Caterine Beck were born in Baden, Germany and Hamburg, Germany, respectfully. The photo was taken on the front porch of what is now my brothers house at 2543 North 37th Street, Galesburg, Michigan, U.S.A. Apparently, Midard always called Catherine, Katrinka for a playful pet name. Please note that Midards right leg bows out to the right. The injury was caused by being thrown from a horse that he was attempting to 'break' in Gull Creek. Apparently, too much Hard Cider was also involved.